Samsung Galaxy S7 and S7 Edge Announced: What’s new? Samsung announced its next flagship in the S-series, Samsung Galaxy S7 and S7 Edge in MWC 2016. The Galaxy S7 and S7 Edge comes with IP68 dust and water proof certification. The Samsung Galaxy S7 and S7 Edge are improved versions of the S6 and S6 Edge in many ways notably getting back Micro SD card support and IP 68 certification means the mobile can be used under water for 30 at a deep of 1.5 meters. And the Camera has Dual Pixel technology. The cooling system is also improved with a copper heat pipe running between CPU and GPU with water inside dissipate the heat. On Hardware front the Samsung Galaxy S7 and S7 Edge has unspecified Processor bundled with 4GB of LDDR4 RAM, 5.1-inch QHD Super AMOLED screen for S7 and 5.5-inch QHD Super AMOLED screen and both has with always on display to display minimal details even when phone is off. The microSD card slot is back with support upto 200GB. The SIM card slot has two slots the second slot being Hybrid slot can accommodate either 2nd SIM or a micro SD card upto 200GB. The Samsung Galaxy S7 is powered by 3000 mAH battery and 3600 mAH powers the S7 Edge and supports fast-charging along with wireless charging. Both smart-phones has IP68 certification can stay under water for 30 min at a depth of 1.5 meters. On photography front, Both has 12-megapixel rear camera with Dual Pixel technology which uses 100% sensor pixels to focus on object and as well as the camera sensor size is increased to 1.4-μm and has F1.7 aperture which improves the low light photography. Both smart phones has 5-megapixel front shooter. On connectivity front both supports 4G support (LTE Cat 9), NFC and MST for payments. On software front, Both runs Android 6.0 Marshmallow wrapped under a improved Touch-wiz, The new Touch-wiz shreds its green theme and comes with new blue theme. Both also also features Samsung KNOX, fingerprint scanning, Samsung Pay works with NFC (Near Field Communication. The S7 edge menu is also improved. 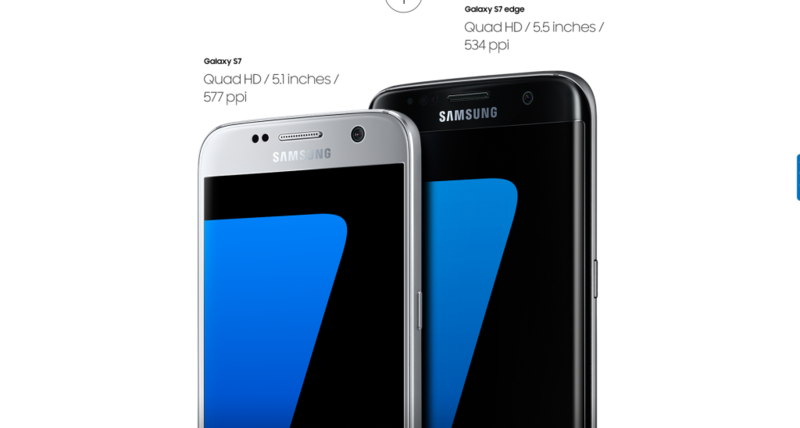 Samsung Galaxy S7 and S7 Edge will be available in Black, White, Gold, Silver color variants. The devices will be available starting mid-March. Prices to be announced later.